If it weren’t for their unique pasts and plans for the future, it was hard to tell who was who among the nearly 200 graduates, dressed in purple and white gowns and golden tassels Sunday afternoon at the Tabernacle in Oak Bluffs. Andrew Freitas moved from Brazil to the Island when he was three years old. Living in Oak Bluffs, he plans to attend Bridgewater State University to study criminal justice, and he says he wants to become a police officer. Across the Tabernacle, Maddie Webster from West Tisbury, graduation ceremony emcee, like Andrew, shared with a reporter the influences from their childhood that have shaped their futures. Maddie described her grandfather’s extensive background in history, adding that growing up, she learned how to read from his books, many including information about American presidents. Maddie’s father Peter stood by with a smile that stretched from ear-to-ear. Nothing really surprises him when it comes to Maddie, he said, adding, “She has so much potential.” Maddie received approximately $4,000 in scholarships, and she plans to study U.S. history at Boston College in the fall. Julia will study mathematics at Colgate University. 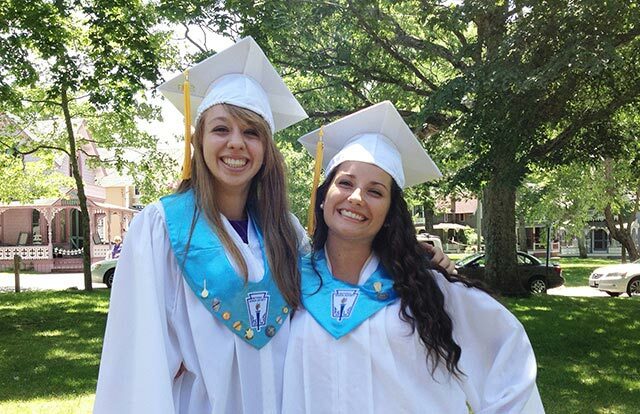 It was easy for Victoria Sadowski to decide what she wanted to study after high school. As several frantic graduates asked one another, “Do I turn the tassel right to left, or left to right?” Principal Stephen Nixon advised them to “take a deep breath” and enjoy themselves. Mr. Nixon told the graduates and their families how instrumental the community has been in getting the seniors to their commencement today and helping them sustain their aspirations. “The community plays such an important role, whether they’re mentors or providing them with jobs,” Mr. Nixon said. “We received over $900,000 in scholarships. I think that is the highest amount we have ever received.” Having that financial help can be influential for many graduates, and for postgraduates as well, who will benefit from $200,000 of the recent scholarship gifts. “It’s not just to get them there, but to help them continue and keep going,” Mr. Nixon said. As graduates, family members, friends, and tourists too, stood around the Tabernacle in the brightly sunlit and dramatic setting, Kiel Maurath, a recent addition to the Martha’s Vineyard special education and history faculty, told a reporter it was difficult to believe this day has come.